Waiting for its arrival has been painful. The petite Latour is a huge monster when compared to my previous Curve. I just can't imagine how its big brother Latour looks like. The huge monster is a full range speaker and its tweeter is a horn based design. It sounds terrific. The energy of music just surround the whole room. Meanwhile I still need to run it for a few weeks until it could deliver its full power. I suddenly think that I am just like a typical character in the martial arts novels. A guy with no "mo kung" at all but somehow encounter the "kong woo ko yan" trying hard to nourish me. Of course I still have a long way to catch up big brothers like Marvel and Mr.Zanden in Hong Kong. I jumped at least ten steps in a very short period of time. I need to take certain time to digest what I have now and to appreciate a full suite of Shindo electronics. Any buddy from Singapore or SE Asia would like to share their experience? Any one uses FLOW powercords on Shindo? Hey dude, remmeber we both like opera on the da vinci! That's quite a nice system out there. Can they rock 'n roll? I have the Flow on the cantata with flying colors. Ain't sure abt them on yours but worth to try. Are you a big fan of opera? Azzuri, good move! I know the sound must be tasty, closer to what music should sound like. This is a big shift of mentality. Can you share how do you adjust from conventional modern speakers like curve to speaker using technology from the old days? Azzuri hing, a very good move......frankly I always dreamt of high efficiency speakers like tannoy and jbl but the reality tis that hey are too big for my place......enjoy! Can you tell me more about the monbrison preamp? I was very excited to know yesterday your speaker arrived. Anyhow, I trust your system has been improved by leaps and bound. As we discussed some time ago, the rack and the amp on the floor would be an issue both sonically and environmentally. You need to address it sooner rather than later as I foresee many people would be interested to come and listen to the S-suite including myself. You have the responsibility to make it sound what it is designed to sound like. Smallpotato, don't just make dream, please make dream come true by taking realistic steps, you have the space and potential to own a very musical system given your CD source, what you need to give up is perhaps a few interconnects, a few amps....just joking...but certainly I see your space has got a lot of envious eyes in terms of a perfect listening area in a typical apartment. Azzuri, Although Shindo is not carried by AE (HK), I am happy you have chosen a great product in your place. I just have one word to say.......Music. Voy R, I like listening to vocal, string instrument and jazz. Opera is one kind of music that I frequently listen to. When I play opera in my system, I feel being embraced by the sound. The system just truely replays every tone coming from the throat of the singer without any trimming nor truncation -- I would say it is free flow of voice. Perhaps my listening room is small and I turn on high volume, I feel myself closer to the singer when compared to my Da Vinci experience. I really need to listen to the Da Vinci Intonation for further comparison. SmallPotato, I believe you are clear that dreams will come true very easily. Just get one high efficiency speakers. My listening room should be smaller than yours. Butcher, I think it is meaningless to you if I say monbrison gives transparent sound, terrific treble, etc, etc. There are already a number of reviews on this pre-amp in the web (e.g. 6moon). Listening is believing. I always welcome you as well as other big bros to come and listen to my gear. You can then make your own judgement on how good (or bad) monbrison is. I used integrated amp before. Thus I may not be able to tell you exactly the good points of a pre-amp. Marvel bro, you are welcome to take the "king seat" when you visit my place. Your act of going high efficiency generates lots of interest, it shows more and more people believe this the right path to get connected more with music. If opera is one of your favorites, your listening notes carry more weight to this old horse in Taipei. Very few in this generation would even try to understand the art of opera. My son covered his ears when I played Frederick von stade every time. Free flow of voices as you described shows your system must already reached some very excellent standard. May I know which CD did you play? Often, the energy of opera singer is large with wide dynamic range. There is always a small orchestra accompaning them. The singer moves around the stage all the time. Free flow of voice is not easy to achieve even with very expensive conventional multi driver design. Voices always sound disconnected. With a horn loading in the tweeter, I can feel your happiness of being surrounded by hall ambience if there is enough on the recording. What about the bass? Hope you go back home earlier, share more. Last, you should find some time to a complete suite of Da Vinci. 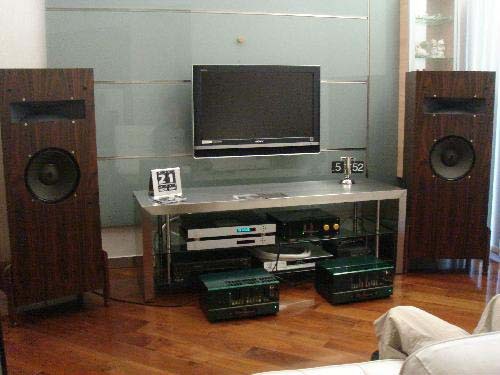 If you are big fan of opera and symphony, this is a system that you will never forget. Frankly I don't spend much time with my gear at the moment. I will have more chance playing with it in the weekend. I listened to 2 CDs during the testing of my new speakers. One of them is Bryn Special Edition (2CD) while the other Anna Netrebko Russian Album. Bass is perhaps too much for me due to the limitation of my small listening room. Sound seemed bouncing everywhere. My room was treated with with acoustic resonators and the condition improved a lot. I feel, when playing opera, my gear just reproduce the whole orchestra in my room. Very shocking. Marvel told me you are a young guy. Good! Prof Hung is my teacher here in Taipei for 15 years. I could not stand opera 5 years ago. With his guidance, I appreciate much more now. Bryn Terfel is one that I like. His sings Mozart's works quite lively. To be frank, my purpose of listening opera is for hi fi evaluation at the beginning. Prof Hung says any system cannot be rated fairly without testing soprano or baritone voices. Then, I learn much more. Most system high frequency starts to break up when high frequency energy goes very high. Piano is very difficult. With the argento cables, the revealation of touchings and transient are amazing. 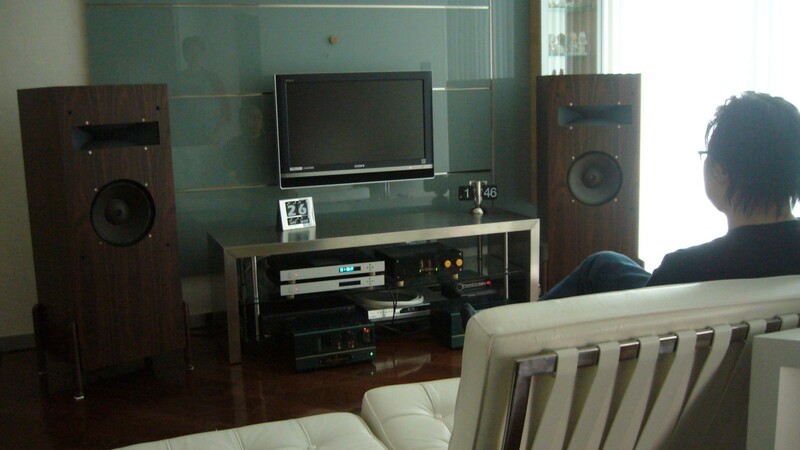 If you heard piano recordings from full range or high efficiency speakers, there is much more physical presence. Because the piano is a very big instrument, full range drivers throw out a very 3D image because fewer phase distortion. Have you tested your speakers with piano recording? Sounds like the system level has quickly reached some excellent state even without burn in if you can play opera loud in a small listening space. Keep up the good spirit. Sometime, old man like us need inspiration from young guy. You should not miss Joan Sutherland. Her voice carries a rich silvery tone, few in history ever matched her technical virtuosity and the athleticism of her singing. Teresa Berganza, a remarkable singer of Lieder from Spain, is a genuine master you should not miss. She brought great insight to a broadly-based repertory ranges from almost any great composers of the past two centuries. The tron syren and the cantata driving the Horning often brings immense emotion to my listening sessions. Your system must be expressive enough without altering the timbre at high passages. Kindly shares more your opera experiences thru your new system. Thanks for your suggestion. Any recommended albums of Joan Sutherland and Teresa Berganza? I will then buy some food (CDs) for my baby Shindo. Azzurri, just grab whatever with these two names. Joan has a special voice to die for. Her articulation of lyrics is not as clear as Teresa Berganza and Frederick von stade. Her tone is warmer with a silvery top end. Try to buy her interpretation of old English songs. How's your system doing? What's PT article all about? PT did not talk about hi-fi in his article. He believed people should continuously pursue knowledge for achieving an enriched life. He shared his view on the present education system. Younger generation was just exposed with more "quantity" of knowledge rather than more "quality". He also quoted an example in China for supporting his view. It is a good article but unfortunately it is writen in Chinese. Ask PT to translate it to English. I listened to Teresa Berganza this afternoon, thanks to PT who brought her CD to my house. PT and Jlam did further tuning with my room acoustics. I am glad that my system is getting better and better now. Finally, thanks for your recommedation. I will go to CD shop and look for some albums of them. We flew all the way to the home of Azzurri today. The Petite Latour is quite a speaker. Before working on room acoustics, I listened to many type of music: Blue Train by John Coltrane, Teresa Berganza recommended by Voy, Eason Chan Get-A-Life concert, Bryn Terfel, Anna Netrebko, and Ayado. Sound is coherent and wide open. The midrange is seamless connected swith the Horn tweeter (radial type). The system sounds big. I knew the potential after 30 mins of warm-up before start working on room acoustics.